The contact card displays detailed information about people and provides one-click access to several ways of communicating with someone. For example, you can send an instant message, start a call, or send an email message directly from someone’s contact card. You can also check free/busy information from the person’s Microsoft Outlook calendar, schedule a meeting, and use the Organization tab to determine where the person fits into his or her organization. And, you can pin a person’s contact card to your desktop to keep it open for easy access. In addition, you can use the Distribution group card for information about specific groups of people. In the search field, type the name of a Distribution group, and hover over the name of the Distribution group in the search results. The group card will be displayed. Let’s start by explaining how to view a contact card, and then we’ll talk about what you can do with it. Find the contact in your Contacts list, then pause on the contact’s picture (or presence icon if pictures aren’t shown in the Contacts list), and then click the See Contact Card button. 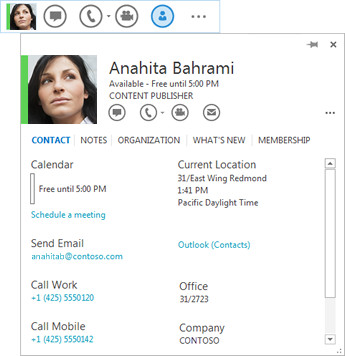 The contact card can be opened from anywhere within Office applications where you see a person’s picture, or a person’s name with a presence icon. Pause on the contact’s picture (or presence icon next to a person’s name), and then click the down arrow to open the card. To send an instant message, either click the instant message button in the Quick Start toolbar (to right of the picture) or click the IM link (at bottom of the contact card). To start an audio call, either click the audio call button to call the person at their work number, or click the drop-down arrow next to the call button to select a different phone number. To start a video call, click the video call button in the Quick Start toolbar. To send an email message, either click the email button in the Quick Start toolbar or click the contact’s email address below the Send Email label. Open the person’s contact card. On the Contact tab, under Calendar, click Schedule a meeting. Complete the meeting request information in the Outlook meeting invitation, and then click Send. Open the person’s contact card and click Organization(located directly under the Call button). You can click the listing for anyone in the organization to view the contact card for that person. You can add information to your copy of someone’s contact card, such as the person’s birthday, work address, additional phone numbers, and/or email addresses. This information is stored in Outlook. You can also change the name of the person so it appears in your Contacts list as a nickname or other personalized name. For a contact in your organization, click Edit. For a contact outside your organization, click Add, and then click Edit. If you have more than one profile for this contact, a dialog box will open asking you which profile you want to change, and whether you’ll want to save the changed profile as the default once you have revised it. Make your selections, and then click OK.
On the replica version of the contact card that opens, to change the contact’s name as it will appear in your Lync display, type an alternate name for the contact in the Name field. Your changes should appear in Lync and Outlook within several minutes. When you pin someone’s contact card to your desktop, the card remains open so that you can quickly view the person’s information or contact them. To pin a contact card to your display, open the person’s contact card and click the Pin button in the upper right corner of the contact card. To unpin the card, click the pin button again, or, to unpin and close the card, click the Close contact card button (X). To hear the contact’s name pronounced (available if the contact has recorded their name in Outlook for voice mail), click the sound button next to the contact’s name. To add the contact to your Lync Favorites list, click the More Options button (… ), and then click Add to Favorites. To display the contact’s social network updates (if you’re friends with them on a shared social network or if their updates are public), click the What’s New tab. To display the distribution lists the contact belongs to, click the Membership tab. To see recent updates to the contact’s information, click the Notes tab. To request that Lync notify you when the contact becomes available, click the More Options button (… ), and then click Tag for Status Change Alerts. Open a contact card by doing the following. Open Lync, and, in your Contacts list, click a person’s name or picture to open his or her contact card. To see more details from your company directory about the person, such as office location, phone numbers, Outlook calendar free/busy information, and time zone, click the Expand contact card arrow in the lower right corner of the contact card. View a contact’s organizational chart by doing the following. Open the person’s contact card, and click the Expand contact card arrow in the lower right corner of a person’s contact card. Click anyone in the hierarchy to view the contact card for that person. Send an instant or email message, or start a call by doing the following. To send an email message, click the Send an email message (envelope) icon. To send an instant message, click the Send an instant message (balloon) icon. In a contact card, the View more options menu, to the right of the Call menu provides the following additional activities for interactions with a contact. When you pin a contact card to your desktop, the person’s contact card remains open so that you can quickly view the person’s information or contact him or her. Pinning a contact card also puts a button in the taskbar for easy access. Open the person’s contact card, and click the pin button, in the upper right corner of the contact card. Click the pin button again to unpin the contact card, or click the Close contact card (X) to unpin and close it. To check the person’s calendar free/busy information, click the Expand contact card arrow in the lower right corner of the contact card. To send a meeting request, click the View more options menu, and then click Schedule a meeting. An Outlook meeting invitation opens.